It's quite an unusual name for a fruit drink isn't it? 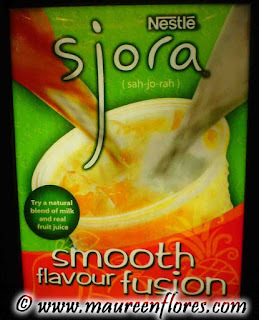 Sjora (pronounced as sah-jo-rah) claims to be a natural blend of milk and fruit juices. The cashier informed me that they have the Peach Mango flavor. I dared to try it and I I liked it very much. It does tastes like peaches and mangoes but the milk gives it the smooth creamy taste. Even my husband ended up sipping more of my drink than his milk tea. 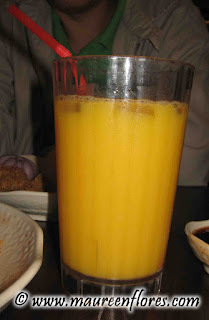 This large glass of Sjora cost Php 35. I hope that they have a Diet Sjora soon as this drink already gives 90 calories.